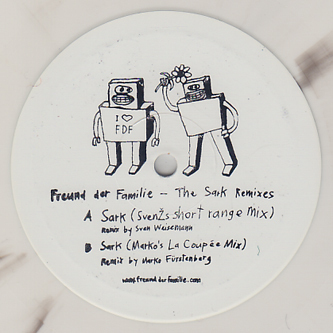 **WHITE VINYL** Of all the nu-school Dub techno producers to have surfaced in the last few years Freunde Der Familie easily rank among our favourites. 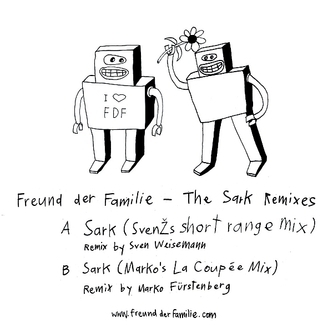 Their 'Konig Der Welt' and 'Sark' 12"s last year were two of the genres highlights so it's quite apt for them to return to 'Sark' with a couple of remixes from fellow dub-housetronauts Marko Fuerstenburg and Sven Weisemann. Sven probably knocked his mix out before breakfast one day last week going from recent form, but it's still up there with his best, applying deft daubs of reverb to every beat, key and chord to make the cut feel like its floating in a sea of frothy Weissbeer, all intoxicating and drowsily merry. Marko's mix does what he does best with a perfextly paced and well weighted rhythmic development, adding layers of rolling percussion in the finest deep house/dub techno tradition with traces of Maurizio and Wolfgang Voigt in the spotlessly clean and well trimmed production. Tip!